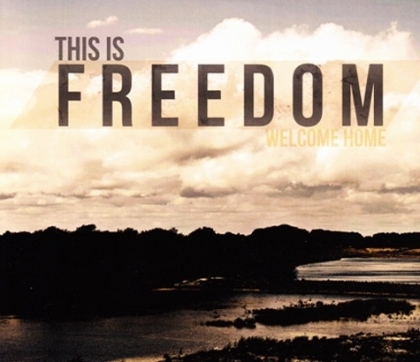 This Is Freedom’s debut EP Welcome Home has been a work in progress since early 2010. Holing up in the studio with producer Frankie Torpey, the resulting 5 tracks mark a ferocious statement of intent from the High Wycombe quartet. Steeped in the influence of noughties luminaries Jimmy Eat World and given a contemporary facelift via the likes of You Me At Six and Francesqa, Welcome Home sounds immediately stadium-sized, symbolic of the band’s ambition. Thematically rich in stories of the band’s own struggles, St Helena opens the record and demonstrates a clear decision that melody won’t take a back seat to imaginative, fluid, riffs. It’s a brew that hasn’t gone unnoticed, given the band’s recent live appearances with Futures, Paige, Lower than Atlantis, and has even brought about several plays of their tracks on the new Channel 4 series ‘Fresh Meat’. Boasting as much dark as it does light, This Is Freedom already sound like the finished product, proving themselves experts in the field of pop-flecked, hard hitting rock. The EP’s title track marches to a pop-punk stomp and shows vocalist Jay Scott’s talents in their full glory, his falsetto creeping in at just the right moments, while Hurricane is a suitably blustery piece of impassioned balladeering, marking the record’s most tender, but no less powerful, moment. As the final guitar riff chimes its way to an end on closer Sticks & Stones, you can’t help but feel that it would be a brave man that would bet against This Is Freedom in 2012, when a headline UK tour beckons. Welcome Home seems as fitting a title as any – let’s hope they don’t leave us any time soon.